Rakovnik Rollers, the only Czech original breed of contemporary light akrobatic pigeons. The breed was named after the city of Rakovnik (40 miles from Prague) - a place where the elite of the stock birds came from. Old records mention that the breed originated as early as in 1850´s. 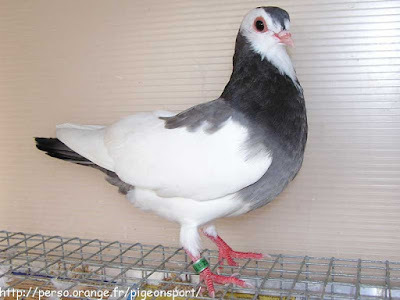 Rakovnik Roller is a pretty, little pigeon. It is extremely fertile and raises its youngsters very well. The Breeding Standard handbook requires the pigeon to be of short body, large chest, small head with wide forehead - a bit flattened on vertices, and short, and a short, slightly thicker beak. Its most valuable characteristic is the ability to roll its body (somersault) in flight. The Rakovnik Roller can do that to this day - which is great, other breeds lost the ability to roll long time ago. Some of the Rakovnik Rollers can somersault over and over and, most of the time, they clap their wings while rolling.